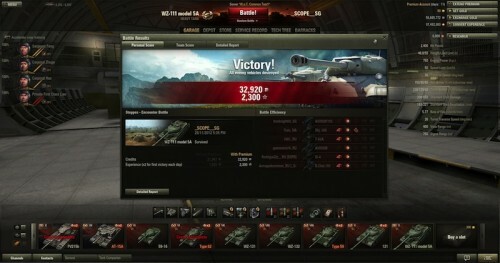 Blitzkrieg is a regular column devoted to the very popular MMO World of Tanks. If you’ve got a topic you’d like our resident expert Matthew “Scope” Pearce to cover, drop him a line! History of the WZ-111 Model 5A. 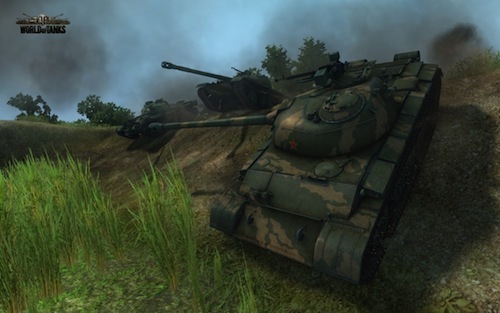 The WZ-111 Model 5A was a prototype of a heavy tank developed in the early 1960’s with the aim of modernising the armoured forces of the People’s Liberation Army. The vehicle was conceived as a response to the Soviet T-10 tank, which was an evolution of the IS-2 and the IS-3 tanks. During construction and testing of the prototype, many shortcomings were discovered and in 1964 development was discontinued. The WZ-111 Model 5A has 150mm sloped frontal hull armour, 80mm side hull armour and 60mm of rear hull armour. I found the upper frontal armour to be rather bouncy due to the V-shaped slope similar to that of the Soviet IS-3 and IS-7 tanks. Unfortunately the WZ-111 Model 5A does not copy the IS-7 and IS-3’s lower frontal plate and thus it is a weak spot on the WZ-111 Model 5A along with the side and rear armour being easily penetrated. The turret armour however is not to be scoffed at with a very bouncy 230mm of curved frontal turret armour, 120mm of side and 60mm rear turret armour. 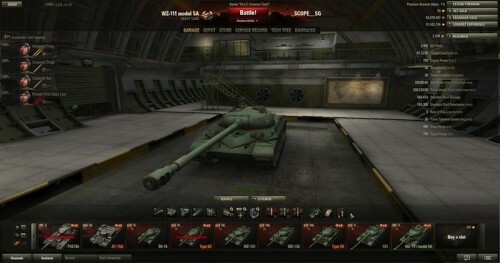 I found myself often bouncing Tier IX and X shells from the front and sides of my turret. The WZ-111 model 5A has a top speed of 50km/h powered by a 750hp V-2-54SC engine with a traverse speed of 36deg. One of the great things about the WZ-111 is that it has good terrain negotiation and is capable of maintaining around 90% of its top speed in off road situations. The WZ-111 turret does have a low traverse speed of only 26deg a second, but a good tanker can make up for that by turning the tank the same direction, adding the tank’s traverse of 36deg a second, giving you overall a 62deg traverse speed if needed. The biggest problem I have with this tank is the lack of gun depression. You simply cannot aim the gun down making it very hard if you are fighting from a high place to engage targets lower then yourself. The WZ-111 model 5A comes with the 122mm 60-122T gun which has an average penetration of 257mm, damage of 440 while having an accuracy of 0.36 at 100m and a rate of fire of 5.77 rounds per minute. This gives a total of 2538.8 damage per minute. The WZ-111 model 5A can upgrade to the 130mm 59-130T gun which has an average penetration of 244mm damage of 490 while having an accuracy of 0.38 at 100m and a rate of fire of 5 rounds per minute which gives the 130mm 59-130T 2450 damage per minute. Both of the guns have slightly lower penetration values than their Soviet counterparts but make up for it with a higher accuracy and a faster rate of fire. Will this tank be used in Clan Wars? 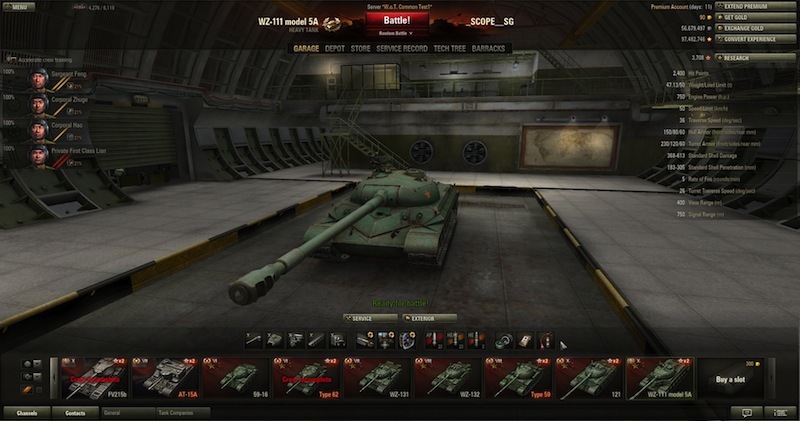 The WZ-111 Model 5A has the same frontal armour as the IS-7 as well as the same top speed of 50kmph, but it does not have the same side or rear armour. In fact, it has much less side and rear armour than the IS-7 but that lower side and rear armour allow the WZ-111 to traverse a lot faster than the IS-7 can. 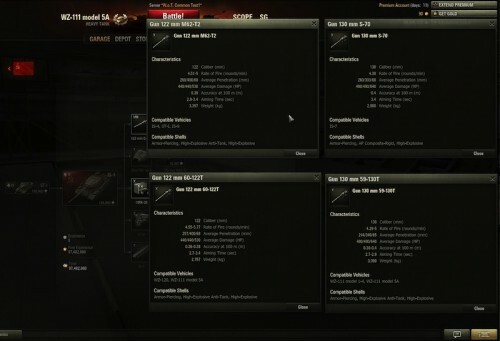 The guns are very similar to the Soviet ones but with less penetration, a better rate of fire and better accuracy. So I think that the WZ-111 may have a place in clan wars where a more accurate and manoeuvrable IS-7 is required – its higher damage per minute is an added bonus. Will I be working towards getting myself the WZ-111 Model 5A in Patch 8.2? To be honest no, but not because the WZ-111 Model 5A is a bad tank – I am busy saving up for the new German Tier X medium Leopard 1. 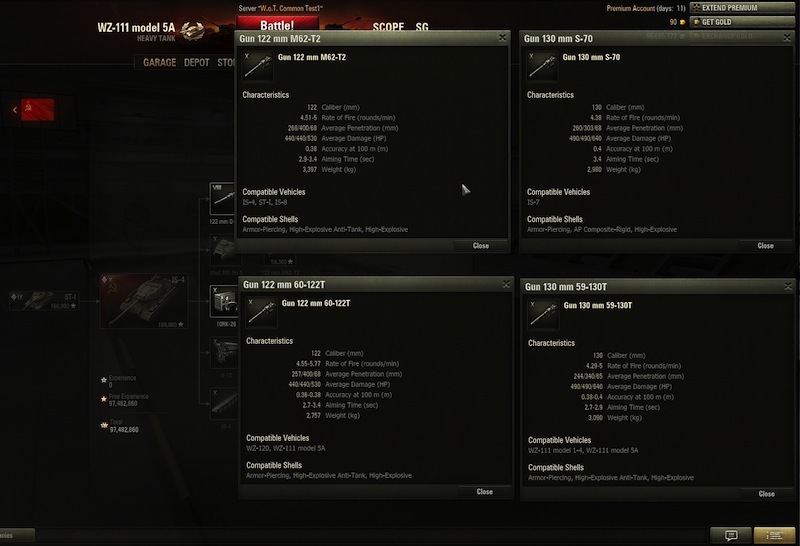 Maybe in the future once I have obtained a Leopard 1 I may start down the new Chinese tree, but I’m currently still working on my British medium line. So over to you my fellow tank commanders: will you be working towards getting yourself a WZ-111 model 5A? Very comprehensive Matt, keep these reviews up!